I have a confession to make…I only just learned that I might like olives. I know, most of you are groaning and wondering, “What? How can she not be sure if she likes olives?” Well, growing up, I never touched one – not even on the finest of pizzas or pastas. I just did not like the taste or the texture! In my twenties, I spent several months in Greece, the land of olives, rolling those salty, black orbs off my plate towards my travelling companions. In the kitchen, I have routinely avoided recipes that include olives. Well, I am told that our tastes change as we get older and I now think this is true, because here is one of my favourite recipes…and it focuses on olives…imagine that! In this tasty appetizer, I love the contrast of the creamy sweetness of the figs and the earthy saltiness of the olives. The fresh thyme lends a lovely floral note. 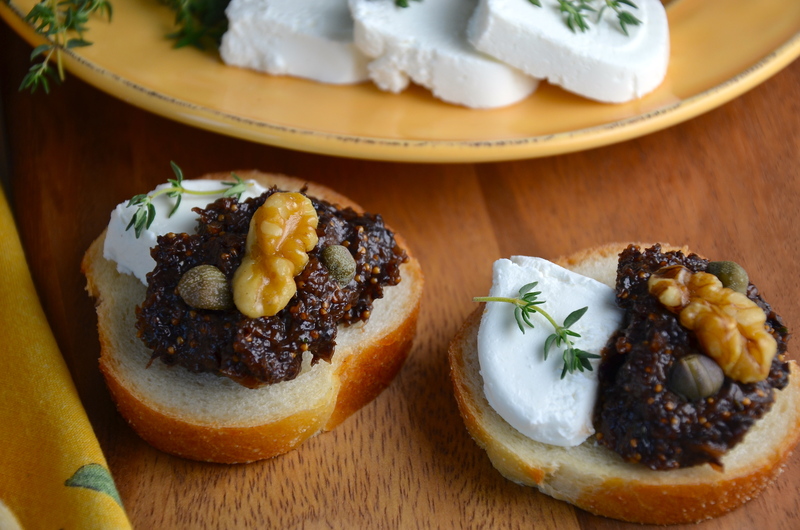 A dab of this tapenade and a thin slice of goat cheese on some fresh, soft baguette and I’m in heaven! I hope you like this recipe too. I found it in a Bon Appétit magazine a number of years ago and have tweaked it to my own taste. Combine chopped figs and 1/2 cup water in a small saucepan. Cook over medium heat until liquid evaporates and figs are soft, about 10 minutes. Transfer to a medium bowl. Mix in olives, olive oil, balsamic vinegar, capers and chopped thyme. With a hand-held blender, lightly blend the ingredients. There should still be visible pieces of of fig, olives, and a few capers. At this point the tapenade can be refrigerated for up to 3 days. Just before serving, stir in the walnut pieces. 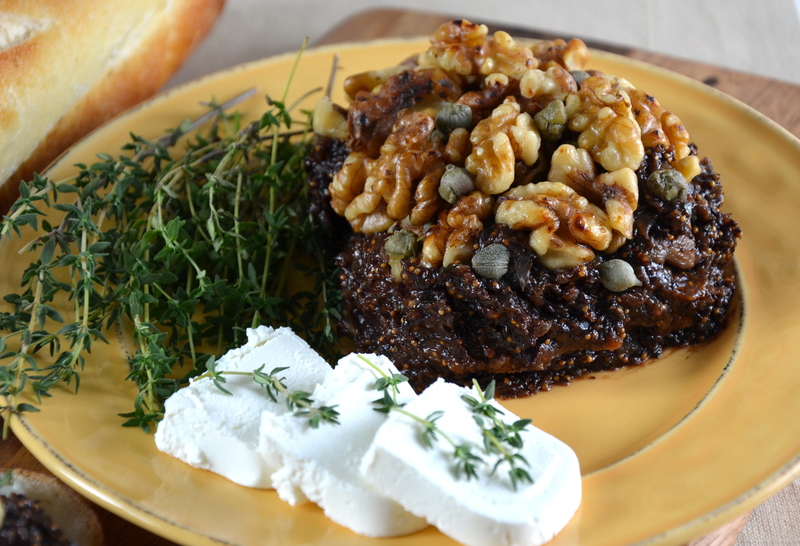 To serve, simply place the tapenade on a platter and top with the walnut halves. 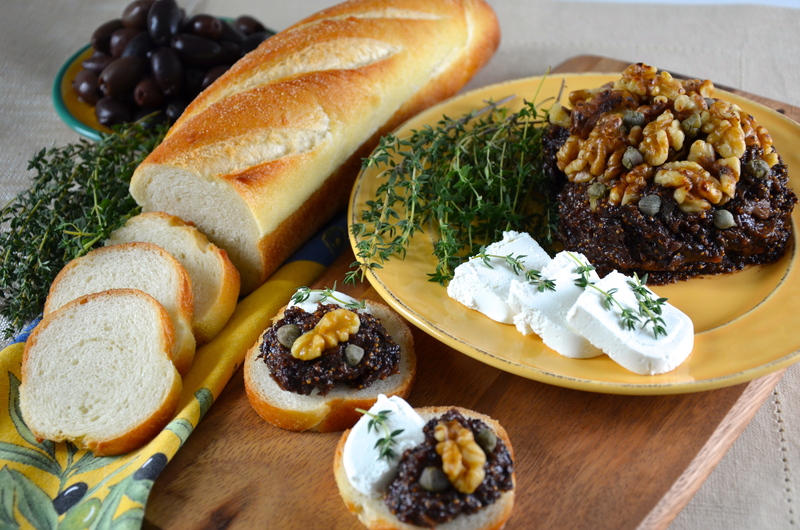 Cut rounds of goat cheese and place next to the tapenade. Garnish with sprigs of fresh thyme if desired. Serve with baguette. Watch your guests gobble this up in a heartbeat! Lol, the exact same story with me, I only just tried them last year. So many lacking olive years to catch up on! Really beautiful photos, enjoy your continuing olive journeys! Too funny! And there are so many awesome olive recipes to catch up on, now that we are part of the blogosphere. Glad you like the pics! Thanks so much for taking the time to comment! Looks so yummy! I may have to try this as I love olives. Hey there ASander! I’m glad you think it looks yummy and I’m really glad you took the time to make a comment. This would be perfect for a girls’ get-together…which I think we should have before too long, no? Such a nice recipe! Will be trying this, this evening. Just the right season for all the ingredients. Had to share this to Twitter, wonderful recipes like this just can’t be kept a secret. Hey there! Thanks so much for taking the time to comment on the recipe! I don’t think you will be disappointed! Glad that you tweeted it too! You’re right, this is all about sharing and enjoying the wealth of recipes we now have at our fingertips! Bon Appétit! What a lovely presentation of the food and lovely photos. Thanks for sharing this great recipe. I love it. Best wishes. Thanks Liz, I appreciate your comments. Maybe over the holidays you can try the recipe. It is great at a party! Cheers! It really is and so easy to make! So nice to discover you blog, by the way. I am looking forward to following you!